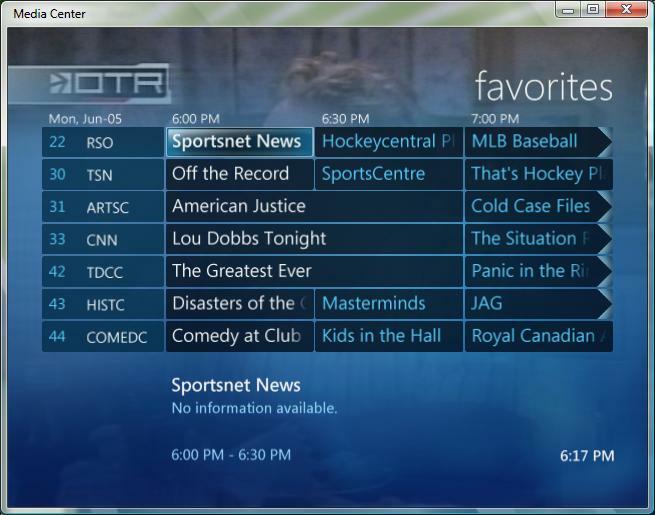 Matt Goyer posted a blog entry describing the new Favorites filtering option for the Electronic Programming Guide (EPG) in Vista's Media Center. 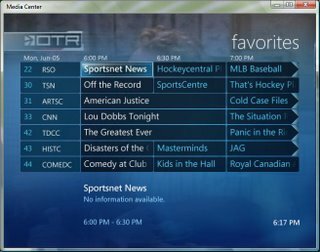 Basically, Media Center will monitor the channels that you most often watch (roughly 7 channels) and display these seven channels in the filtered output. This is a new filtering option, joining the previous filter options of 'On Now', 'Sports', 'Kids', 'Movies', 'News' and 'Specials' found in Media Center 2005. Unfortunately, there isn't a way to specify your own 'Favorite' channels, as the thinking behind this is that the most commonly viewed channels will match your 'Favorite' channels. Select ‘Favorites’ will narrow the guide down to your favorite channels. Your most commonly watched channels may not be your favorite channels.